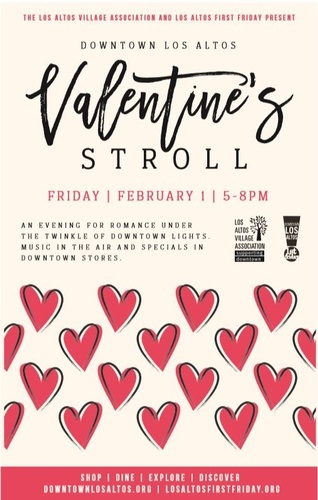 Visit Downtown Los Altos from 5-8pm on February 1st for our 2nd Valentine’s Stroll through Downtown Los Altos. Discover unique gifts, enjoy sparkling lights, shopping delights and fun at shops throughout Downtown Los Altos. End or begin your romantic evening with dinner at one of our many fine restaurants. Presented by Los Altos Village Association and Los Altos First Friday.